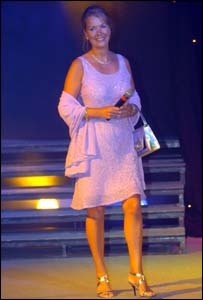 A cameo appearance at Miss Wales 2004 by Helen Morgan, who was Miss World for just four days in 1974, underlined how beauty contests have changed since their heyday. Flown in from Spain to help judge the Miss Wales contest, Helen - now 52 and Mrs Lamb - seemed from a bygone era at the brash event in Swansea. She saw Amy Guy, a trainee architect from Wrexham, take this year's crown. Amy, 21, now hopes to emulate her at Miss World in China in December. Helen Morgan added the Miss World crown to her Miss Wales and Miss United Kingdom titles in the days when millions tuned into the contest on live mainstream TV. But her reign lasted only a few days after the revelation that she was an unmarried mother. Thirty years on, she presented a rather demure figure in contrast to the thunderous noise and raunchy dancing of Thursday night's event in a Swansea city centre club. Her long hair neatly coiffured into a French pleat and wearing a lilac evening dress and matching pashmina, she still looked every inch the beauty queen. But what a contrast it must have been to 1974. Then, she was paid £30 to enter Miss Wales as a last-minute stand-in, duly took the title, and swept all before her. The 21st Century beauty contest means throwing out the bathing costume parade as the organisers try to fight off criticisms of its place in the modern world. So today we have 24 girls displaying their charms for the six judges and crowded club first in Welsh costume (red and green hot pants and matching pom-poms for the uninitiated), then flowing evening dress, and finally "outrageous" club wear. But at least one girl's costume covered much less than an old-fashioned swimsuit and most consisted of the shortest of skirts and skimpy tops. Helen Morgan, originally from Barry in the Vale of Glamorgan and now a married mother-of-three and happily settled in Spain, told the audience she was thrilled to be back in Wales and to receive such a warm welcome. "It's so green here and there are so many smiling faces," she said. She also warned the contestants that the winner's life would never be the same. But she did not say much else because she has been " bought up" by a national newspaper. Instead, most of the cheering came from the large contingent of supporters for Brooke Cameron, from Porth in the Rhondda. They had been bussed in for the event complete in "Valleys Girls Support Brooke for Miss Wales" T-shirts. But, sadly for them, she was not to walk away with the winner's tiara, which brought with it a shopping weekend in New York and a host of other prizes. Amy Guy, who lists horse-riding among her interests, beat them all to the crown, and she now has a hectic schedule ahead as she prepares for Miss World in China. Welsh hopes are now pinned on her to emulate Helen Morgan and to bring back that crown 30 years on. But if she did, it would be to a very different world.